Students at one metropolitan-area elementary school are getting a real-life lesson in cause and effect today. Last winter they had a lot of extra days off from school because of dangerously low temperatures. Some summer activities were limited by the heat and the drought. All of that extreme weather put a lot of stress on aging area water mains and pipes. Finally in the last few weeks there has been some rain, which swelled the soil. Then some early freezes caused connections to snap. One of the sites Leeds’ workers are repairing today is a water main break on Englewood Road between N. Oak Trafficway and Antioch Road in the Northland. Just up the street from the work site is Oakwood Manor Elementary School, which will be without water all day. North Kansas City School District administrators have sent over bottled water and sack lunches. Many of these young children are still learning good hygiene habits, and they are having to use hand sanitizing stations instead of being able to wash with soap and water. Toilets are not functioning properly. And cafeteria workers are unable to prepare warm meals or clean up afterward. A couple of weeks ago, Martin City K-8 in the Grandview C-4 School District had similar issues. 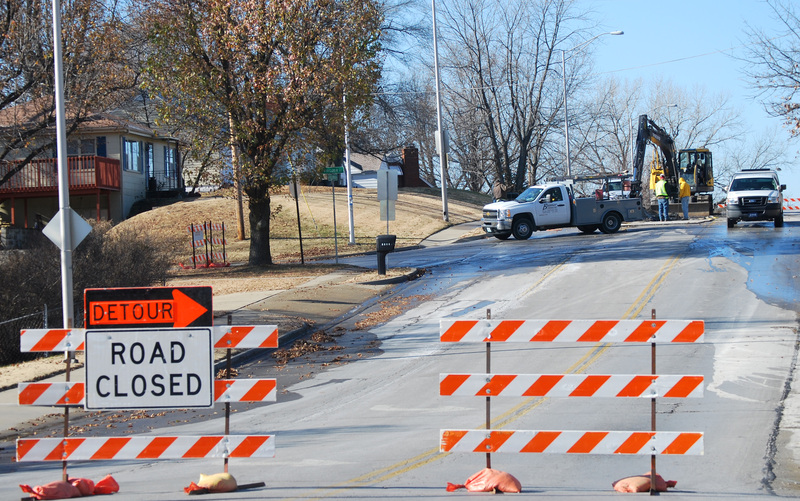 A Kansas City, Mo., water main at 139th St. and Wyandotte Road led to a boil order on Tuesday, Nov. 22. So long as extreme weather continues, and until Kansas City, Mo., manages to replace all of its aging infrastructure, it is likely water main breaks will continue to cause difficulty for schools. UPDATE 12/8/2011 11:05 a.m.: Original water department estimate was eight hours to repair the broken main on Englewood. However, repairs continue for a second day today. UPDATE 12/9/2011 10:28 a.m.: Day three, and the road is still closed in both directions. Water main repairs continue.